Dimensions: 11-1/2" x 17" x 8-1/2"
Dimensions: 13-1/2" x 19-1/2" x 10"
Hand Carry Shopping Baskets increase sales! 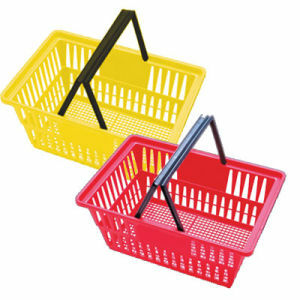 Place these baskets around your store for your customers to use. Customers will buy more when they don't have to carry their merchandise around in their arms. • Stackable to save valuable floor space. • Ergonomic Handles, designed to improve comfort. • Two convenient sizes that holds up to 50 lbs. Express 11 1/2" x 17" x 8 1/2"
Large 13 1/2" x 19 1/2" x 10"
• Guaranteed for 1 year. • Small Minimums for Printed Baskets. Advertise your store for pennies. • Baskets nest compactly with only 1" stacking room needed. Personalize these Baskets for only $0.50 per basket. Hot Stamped Logos are long lasting and less likely to scratch or come off compared to labels and silk screening. Minimums for Hot Stamping: Express 60, Large 48. One time Plate Charge $95.00. Call 1-800-426-5708 to order your personalized baskets.